We bought our vacant property in 1985. Twenty two acres of woodland, sloping hills, open fields and farm land. In the early years, my wife and I developed a master plan and have pretty much kept to the original concept. The house, my shop and gardens consisting of a fire pit settled within an Adirondack motif. We practice square foot gardening in a vegetable garden with raised beds, an herb garden, a garden shed, patios, walkways and stone walls. Our display gardens are a mix of bulbs, annuals, perennials, trees and shrubs. The gardens are designed within full sun, part sun and shade conditions, which surrounds our home; and fortunately for us, every window has a different garden view. It's the perfect setting for entertaining with family and friends. Sorry, the garden is not open to the general public. However, some of Fox Creek clients are invited to discuss their landscape plans and have a first hand view of suggested ideas. The herb garden with Scooter, on the clock, as our biological pest control. this into an art form. 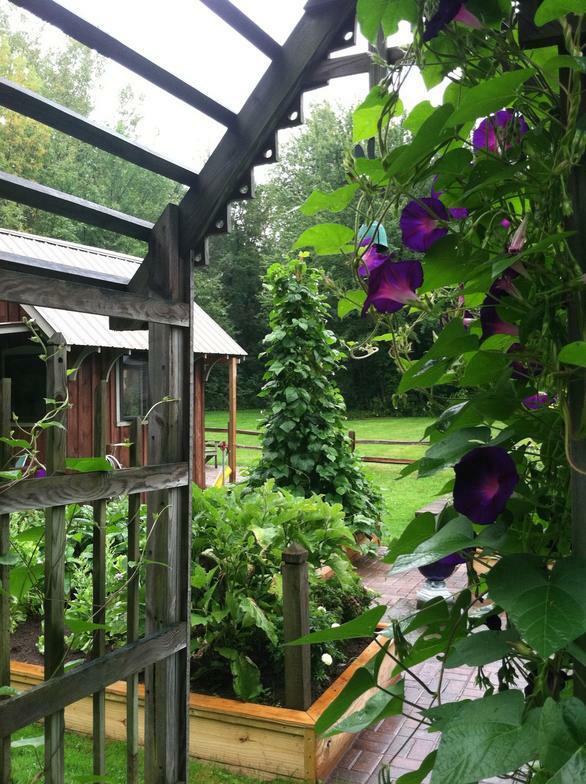 Looking through the arbor to the vegetable garden with raised beds (square foot gardening practiced), bean teepees and President Tyler morning glories. Dave, at the garden shed, thinking of his next project. Tasha, just being a dog.